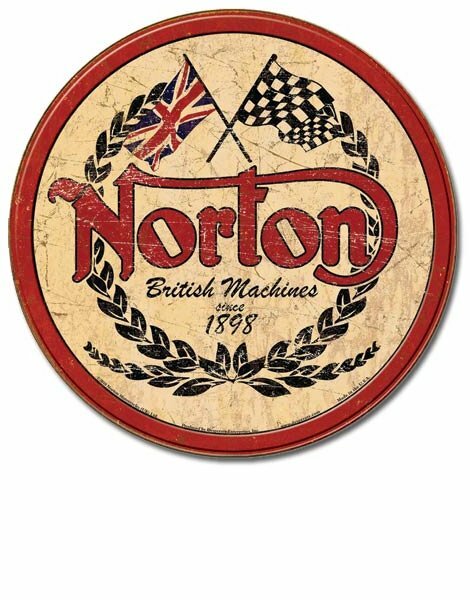 This beautiful tin metal sign is a reproduction of an old Norton motorycle dealership sign. It even depicts an "aged" look and it would look great in your garage, home office, family room, etc. A great addition to a motorcycle enthusiast's collection or a great gift for the Norton motorcycle lover. This is a metal sign, made in the U.S.A. Measures 11.75 inches round. UPC: 6-05279-11705-5 | Part No. 1705. Ask a question about "Norton British Machines Since 1989" Tin Sign.